On Friday March 21, CBC announced that Chiheb Battikh pleaded guilty to attempting to kidnap the grandson of a Quebec billionaire for ransom. Battikh was having financial trouble and intended to demand a ransom of $500,000 from the wealthy family of the three-year-old victim. ​Battikh tried to kidnap the boy on the afternoon of Dec. 19, 2012, when his father went to pick him up from daycare. The two crossed through F.X. Garneau Park in Outremont to get home — the father pulling his son on a sled. That’s when the father, who cannot be named to protect the child’s identity, noticed they were being followed. Battikh punched and kicked the man in the head and face, and used a stun gun to try to neutralize the boy’s father — but missed, only getting his ear and neck. Nonetheless, the father lay on the ground, pretending to be injured. Battikh snatched the three-year-old boy and ran. The father chased after them and managed to tackle Battikh. Neighbours heard screaming and called police, while one witness rushed to the father’s aid and helped him neutralize Battikh. The attack occurred in broad daylight, around four o’clock in the afternoon. Unsure whether Battikh would be released before his trial, the toddler’s family hired bodyguards and left Montreal for the protection of their child and their own. After his arrest, Chiheb Batikh was defended by Me Denise Fernet, a court-ordered counsel, who was rapidly replaced by Me Marc Labelle, a prominent criminal lawyer in Montreal. Battikh’s leadership role with the Muslim Association of Canada was not mentioned by the CBC but it was referred to by Montreal La Presse after Battikh’s conviction. Kidnappings for ransom are very rare in Montreal and in Canada in general. However, many cases of Coptic Christians being kidnapped by Islamists for ransom have been reported in Egypt in recent years. August 30, 2011 – VIDEO Chiheb Battikh identifies himself as a MAC spokesperson and invites its supporters to take part in activities organized in Laval (north of Montreal) to celebrate the end of Ramadan 2011. November 2011-October 2012 – Chiheb Battikh is an administrator of the Muslim Le Savoir School. According to information on the Quebec Registry of enterprises, from 2007 to 2009, the name “École Le Savoir” was used by the Muslim Association of Canada. In 2008, Ecole Le Savoir got its own enterprise number in Quebec (1165169500) and has operated as an officially distinct entity from MAC since. Le Savoir School / Association treasurer and VP, Samer Majzoub, is also the vice-president and treasurer of the Canadian Muslim Forum that represents many organizations associated with the Muslim Brotherhood infrastructure in Quebec, including MAC. February 15, 2012 – In a motion by MAC to the Superior Court to compel the transfer of the ownership title of a building located at 615 Belmont in Montreal, Chiheb Battikh is identified as MAC representative responsible for the purchase of the building. References are made to Chiheb Battikh in sections 22, 24, 25 and 26. 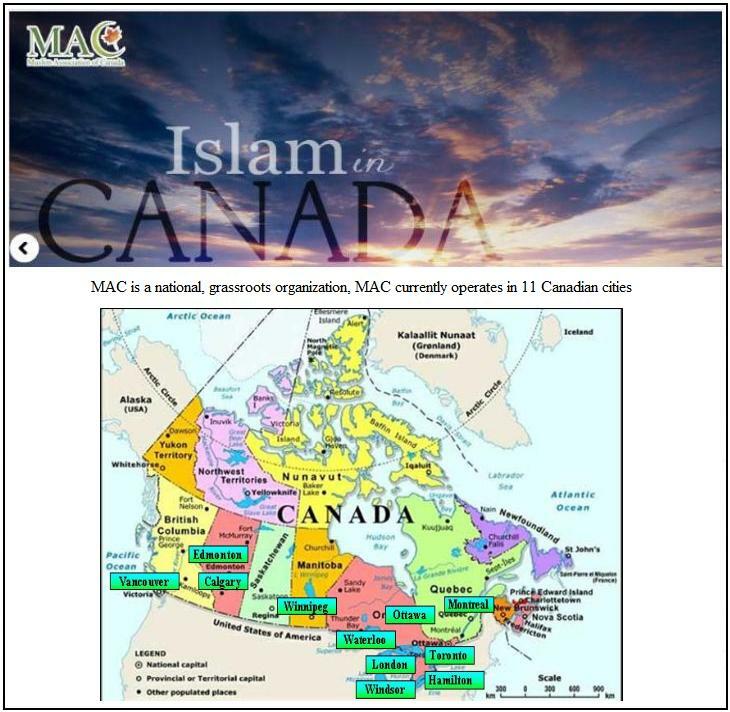 December 2012 – MAC’s Springs for Knowledge website identifies three positions occupied by Chiheb Battikh in MAC’s organization chart: head of MAC Education Department, director of the Canadian Institute of Islamic Civilization (Montreal Chapter), a MAC substructure, and instructor of young Muslims enrolled in MAC’s Springs for Knowledge program. In his 50-point manifesto, Hassan al-Banna urges his supporters to abolish political parties and replace them by a single party system. He favors the modification of laws so that they conform to sharia and calls for the multiplication of associations dedicated to promoting the spirit of jihad amongst the youth. In his essay On Jihad, al-Banna explains that “it’s an obligation for us (Muslims) to fight against them (the infidels) after inviting them (to join Islam), even if they do not fight against us”. In another text (To what Do We Invite Humanity? ), Hassan al-Banna refers to Adolf Hitler as a role model for Muslims looking for “success and fortune”. Point 4.4 The Ikhwan (Muslim Brotherhood) must understand that their work in America is a kind of grand Jihad in eliminating and destroying the Western civilization from within and “sabotaging” its miserable house by their hands and the hands of the believers so that it is eliminated and God’s religion is made victorious over all other religions. In 2009, MAC stated that it was operating in 11 Canadian cities. Its penetration has reached other cities since.